Peter Piper picked a peck of pickled peppers, and then he put them in the fridge and somehow they got pushed to the back behind the eggs and milk and then he forgot about them until one day he found them... all soft and shriveled. Ever happened to you? I hate to admit it, but I find more produce in my fridge that I had planned to use and then forgot about than I care to say. Such a waste. As a mostly plant based family, my fridge is filled to the brim with fresh veggies and fruits, and as I mentioned earlier, occasionally my eyes get the better of me at a local farmer's markets and I arrive home with not one, but 4 gorgeous bunches of various colored lettuces. With all good intentions I toss together a salad, and then another the next day. The third day may find me blending some of the tender leaves into juice, but the fourth day has met tired of lettuce. So I let it sit a day or two, and by the time I'm back to it the beautiful leaves have begun to wilt, or perhaps have even become slimy and spoiled. Enter the Greensaver. I love a good science experiment, and when OXO sent a Greensaver with Activated Carbon System in combination with some of my favorite multicolored Mini Sweet Peppers from Melissa's Produce I placed most of the peppers directly into the Greensaver leaving a handful in the bag they arrived in. And I tried to forget about them. But for once I couldn't forget about my gorgeous perfect produce and checked them almost daily. Peppers, though, have a longer shelf life than many greens, and I didn't really see much of a difference in the first week in the fridge. But then I did forget about them. Really... they got pushed to the back, and it wasn't until I realized my Oxo deadline was fast approaching that we dug back into the fridge half expecting to find a science experiment gone too far. 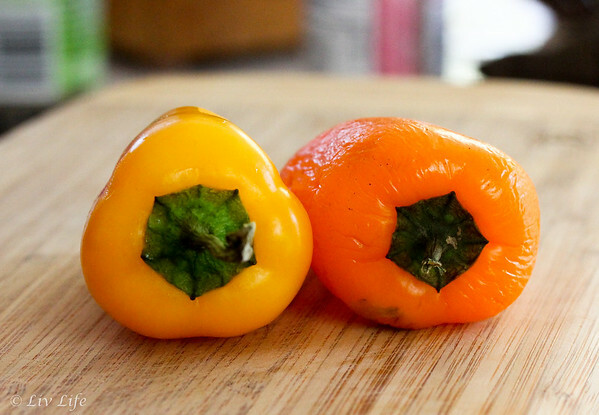 Pulling the peppers from the bag I found somewhat soft and shriveled fruits. Still edible, but no where near their prime. However, popping the top of the Greensaver we contrarily pulled out gorgeous, photo-worthy (photos show each and every blemish) crisp fruits! Can you guess which pepper had a stay in the Oxo Greensaver?? That's when I turned tail and headed to the store for more Greensavers. Yes, I'm now the proud owner of 4 Greensavers and tomorrow morning they will all be filled as I arrive home with that extra produce I just won't be able to pass up at the local market. Storing my veggies and fruits in the bags I brought them home in has been something I've always done. Occasionally I place a paper towel in the bag, but more often than not I don't. But after some research, I've come to find that storing produce this way may actually cause it to go bad faster, ergo that slimy lettuce when I reach for it to make my salad after just a few days in the fridge. Ethlyene Gas - Fruits and vegetables give off Ethlyne Gas. Exposing produce to the gas speeds up the ripening process (ever put an apple with bananas to ripen them faster?) and can cause over ripening which can then lead to spoilage. Improper Airflow - When produce rests up against the walls of a bag or container, moisture can build up and cause rotting. Uncontrolled Humidity - Fruits and vegetables require a perfect balance of humidity to remain in peak condition and prevent softness or wilting. To make things harder, different varieties of produce have different humidity requirements. Thankfully, the OXO Greensaver can help solve these issues! First the Ethylene Gas. The Greensaver uses a plant based (coconut husk - making them safe and non-toxic) carbon filter to absorb the gas which in turn slows down the ripening process and slows spoilage giving you more time with that gorgeous lettuce. Airflow. 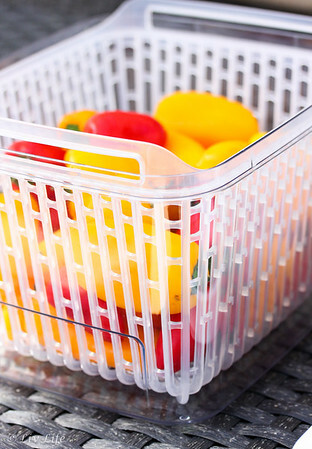 The Greensaver uses an elevated basket lifting the produce up and away from the bottom and sides of the container and allowing air to "flow" around the produce. And as a bonus, the basket simply lifts out of the box and can be used as a colander. Humidity. A vent on top of each Produce Keeper slides open and closed to maintain optimum humidity levels for different kinds of produce keeping them crisp and fresh. According to my experiment (we actually followed the scientific method! 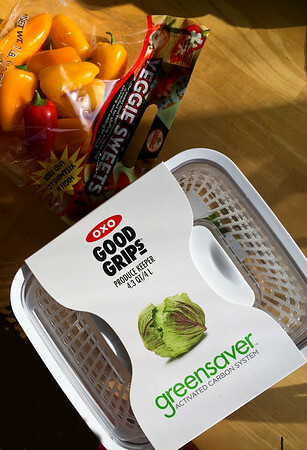 ), this OXO Greensaver works. 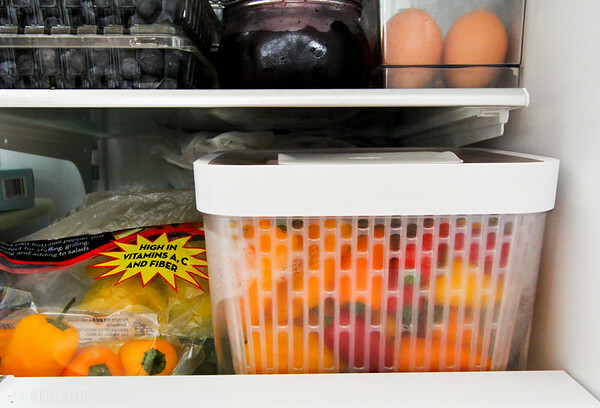 And not only does it work to keep the produce crisp and fresh longer, it organizes your fridge! I love the clear boxes allowing me to throw away those opaque grocery store bags where you can't really see what's in them and instead to see directly into each bin and know exactly you have on hand. 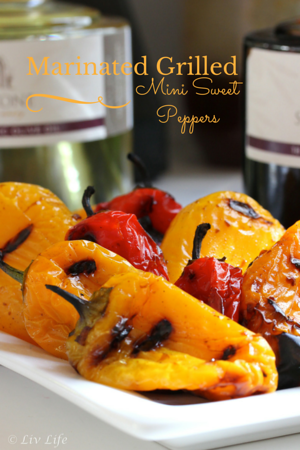 My thanks to OXO and Melissa's Produce for sending us a Greensaver and those crisp, sweet mini peppers. I'm sold on the Greensaver. And my produce? We're enjoying more time together! It's 4:00 somewhere, isn't it?? Whatever the local time it's always the perfect time for tea, at least in my world. 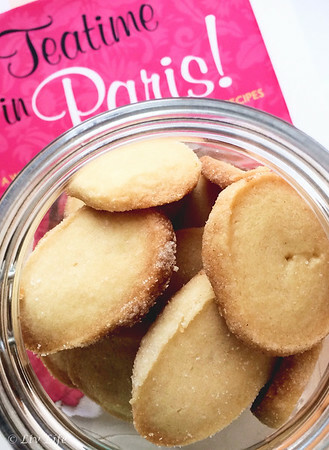 So, as this year's travel plans are rounding out to be more of a "San Diego Staycation", I'm bringing a little bit of Paris to me with Jill Colonna's new book, Teatime in Paris! : A Walk Through Easy French Patisserie Recipes . Jill and I go back a long way. Actually, she and I were BFFs (Best Friends Forever) even before we first became truly acquainted. You see, I discovered Jill's first book, Mad About Macarons! 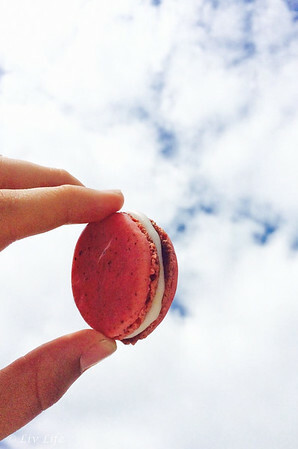 : Make Macarons Like the French , when when researching the art of macaron making and the book became my constant companion during mom driving duties. Reading the book from cover to cover in the school pickup line, at the dentist, waiting at dance class, etc, and then perusing her blog and actually watching her on tv (a Scottish morning show - The Hour), Jill and I spent hours and hours together, and I'm positively certain she would have felt the same kinship I did if she had only known I existed! Since then we've followed each other through our blogs along with occasional emails and we've watched as our similarly aged girls have grown into lovely young women. I've virtually enjoyed spectacular days in Paris through Jill's lovely photos (love her instagram! 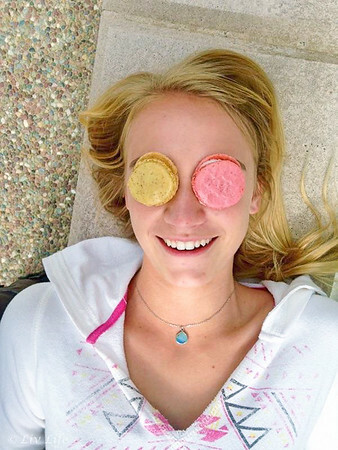 ), and I've envied her constant supply of macarons with flavor combos I can only dream of. Her sense of humor and pure love of life make her simply the best of companions (My dad loves her too!). Carlsbad Dance Centre Senior Dancers enjoying Teatime in Paris! But even more excitingly, Jill has joined me once again and spent the last few weeks traveling around Southern California with the launch of her new book, Teatime in Paris! While she may not be innately aware, her Strawberry Eclairs (pg. 84) tempted the dancers and dance moms at an LA Dance Competition, she's spent hours contemplating Choux Puff technique while lounging on local beaches, and she had Liv's orthodontist captivated with her Fast Fig, Almond and Lavender Tarts. However, our most fun excursion by far has to be the visit to Liv's Honors Algebra Class for a Career Day Presentation. Who knew food blogging would garner such attention? But with Jill's book in hand, how could it not? Explaining that food blogging perks include reviewing cookbooks like Teatime in Paris, the kids took the task to heart. 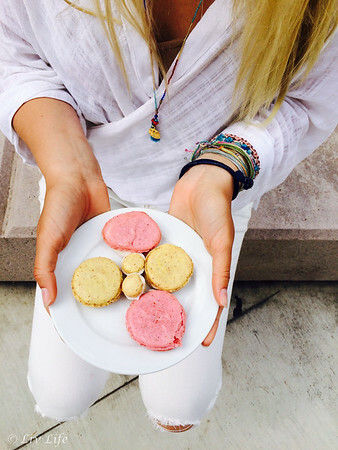 With a plateful of Jill's Lemon and Grapefruit Macarons (yes... I bribed them so I would be the most popular presenter...) and a jar of glistening Diamants (Diamond Biscuits p. 40), these mathletes brought out their creative side as we discussed recipes from the book and food photography, and then set them off to photograph the treats on their own. 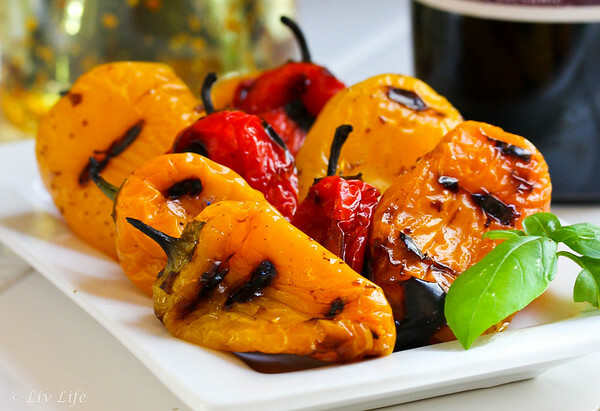 I had entered the class somewhat confident in my food photography skills - I've had photos published in magazines, splashed on websites and even sold as prints and on cards. But after seeing the creativity these kids brought for this review, my confidence has been knocked down a peg or two, but I am newly inspired to try different angles and see things in a fresh way. And try new things we did. Teatime in Paris brings the Pâtisserie to your kitchen, and no, you don't need to be a master chef to taste these treats in your own home. 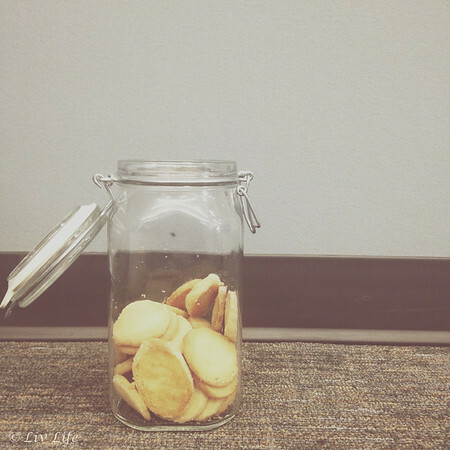 Thanks to Jill and her easy to follow directions, you can have fresh, crisp Almond Tuiles (pg. 46) with your tea in just over an hour - and with ingredients you probably already have in your own pantry. Teatime in Paris guides you step-by-step through recipes from simple teacakes through eclairs, cream puffs and the delectable French Macaron. 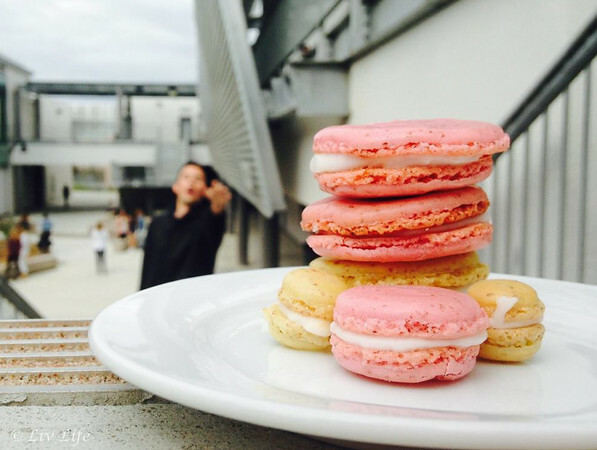 All are within your reach with Teatime in Paris recipes. Planning a trip to Paris yourself?? 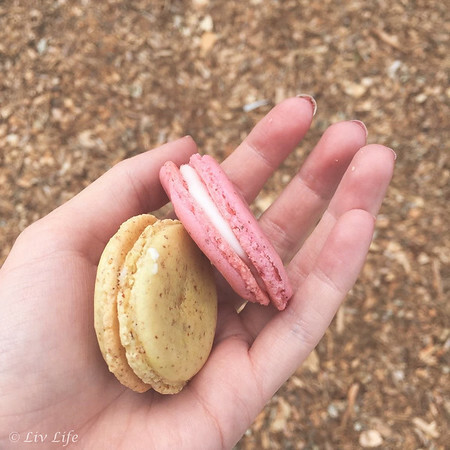 Jill also fills you in on some of her favorite, tried and true teatime and Pâtisserie locations in the city along with history and lore of the treats you will find there. So what are you waiting for? It's teatime somewhere... what will be your Teatime in Paris treat of choice? Sometimes even the best laid plans go awry, don't they? Take Mother's Day for instance. I had plans of being unabashedly spoiled by my family. Think pancakes prepared for me (not by me), someone else doing the dishes, a nice long nap and then dinner with my own mom. Sigh... all the makings of a "perfect" leisurely day, yes? Alas, the fantasy somehow doesn't always quite unfold as planned, and now I find myself questioning, "What really is prefect, anyway?". Liv adding in a last minute dance competition on Mother's Day found me up at 4:50AM making pancakes to fuel her for the morning. Rushing, we just made our 5:15 departure with hair and makeup done, costumes in hand, and lunch prepared and packed for the day. Luckily our travel time to San Diego took a mere 26 minutes getting us to UCSD early, however I had left the kitchen strewn with the remnants of pancake and lunch prep along a list waiting for me to finish before my parents arrived later that evening for dinner. Competition days are exciting and bring me complete joy as I watch my confident, beautiful girl up there on that stage, however, after some 6 hours surrounded by blaring music and hundreds of teenage dancers one's head can begin to ache a bit. Arriving home by 2PM and with only 2 1/2 hours to get dinner on the table I set to cleaning the kitchen from the morning mess and I'll admit to feeling a bit miffed that no one stepped up to help. It was Mother's Day after all, wasn't it? Hours later with a tidy kitchen, freshly made garlic and sundried tomato bread (my mom's favorite - recipe coming soon! ), dinner prepared and dessert baked, Mom and Dad arrived and I shared a beer with my dad completely forgetting to prepare the Strawberry Champagne Cocktail I had planned. After a lovely dinner, my husband and I cleaned up the kitchen again and I longed for a bath and bed when my son called in needed help with an issue at college. Just finishing the call, Liv came down needing help with her homework and my husband commented that his uniform shirts weren't ready for him to head to work in the morning. Sigh. Feeling tired, overlooked, and even a little unappreciated, I finally found that bath. Easing my tired back my phone beeped as my son texted a thanks for helping him along with "Looking forward to seeing you in a few weeks. I have a few friends I hope you'll be able to meet." Wow... he really wants me to meet his friends? My heart lifted. Popping in later to tell Liv goodnight she said, "Come here..." and enveloping me in a huge hug it was the "Mom... I'm so lucky God gave me to you. You're the best mom ever. I don't know what I'd do without you!" that completely melted my heart. Heading to bed my husband also embraced me whispering, "You were amazing today... thanks for holding our family together." It was then that I reflected that yes... my day had indeed been perfect after all. I spent Mother's Day doing exactly what I love. Being a mom. And I wouldn't change a thing. 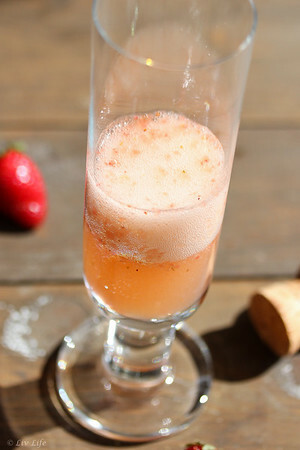 And so the spoiling was left for today when Stacy of Food Lust People Love completely spoiled me with her version of this fabulous Strawberry Champagne Cocktail. May's Blogger Clue Series (#BloggerClue) prompt of "Berries" transported me to the other side of the world where I perused Stacy's incredible recipes and learned a bit about her life in Dubai. With her lovely smile and kind heart, Stacy references her many travels and warms my heart with her love of her girls, husband and adorable boxer, Beso. 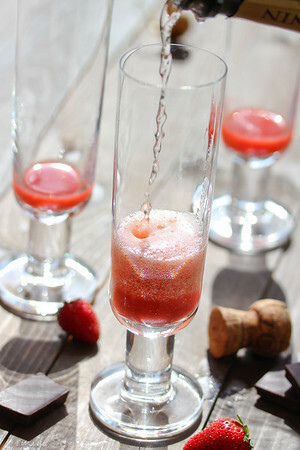 Choosing from a plethora of luscious berry recipes including Blueberry Muffins, raspberry treats and even more strawberry muffins and breads, this Strawberry Champagne Cocktail had been meant for Mother's Day, but ended up being the perfect complement to a spontaneous Day After Mother's Day brunch with my husband as we laughed and completed the photo shoot together. So here's to Stacy, a mom like me who gets by day to day and loves her job as much as I do. Cheers my friend! Thanks for spoiling me today. And now won't you join me as we discover what the rest of our lovely Blogger Clue Society brings to the table? 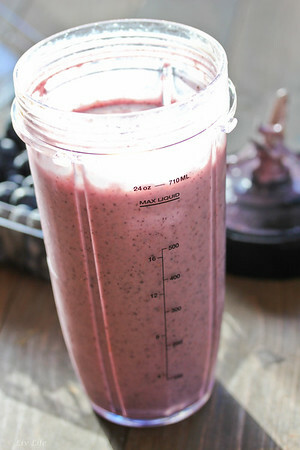 Blueberry and banana... simply one of life's perfect combos, and one we've been blending to morning smoothies for years. Be it an addition to a plethora of fruits, creamy with yogurt or milk of some sort, or just blended together for a creamy frozen treat, we never tire of the pair. But today we added almond, and oh my heavens, I have a new favorite. Already creamy with almond milk, I attempted to boost Liv's protein even more with a scoop of almond butter, and the addition elevated the smoothie to pure decadence. Almost more dessert tasting than healthy morning starter, Liv's comment of, "Mom... Yes. You totally win!" as she sent a snapchat to her friends had my heart swelling. While we used almond milk for our version, any milk will do, and I can only imagine a carton of creamy vanilla yogurt would be a delightful addition. 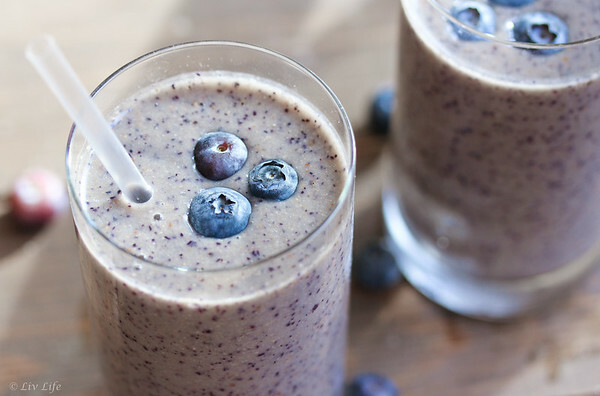 Blueberries, banana and almond butter... who knew? 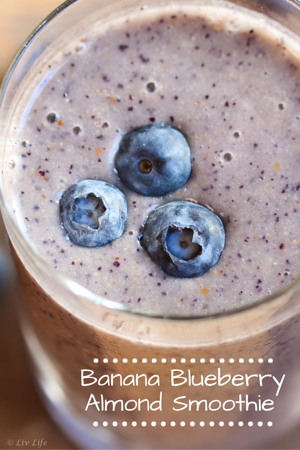 Creamy and filled with blueberry banana goodness, a scoop of almond butter gives this a milkshake taste. Place all ingredients into a blender and blend until creamy. If the mix is too thick add additional milk or a little water. Garnish with a blueberry or two and enjoy!